Cast iron skillet chocolate chip cookie recipe is always sought when you want to make quick dessert for dinner party. Chocolate chip cookie is indeed one of the most favorite desserts ever. It tastes incredibly gooey and delicious. It can be served with vanilla ice cream, chocolate syrup, or a glass of milk according to your preference. The dish is surely going to be a delightful end of a three-course meal. Traditional chocolate chip cookies are baked individually in smaller size. However, if you do not have time to bake it that way, you can make easy skillet cookie instead. Make a larger sized cookie directly in a skillet and cut it like pizza. It will be as delicious as the traditional cookie. To start making cast iron skillet chocolate chip cookie recipe, preheat your oven to 350 degrees F (180 degrees C). Prepare a 9 inch heavy-bottomed cast iron skillet. Place it over the stone (low heat). Add in butter into the skillet. Wait until the butter is completely melted. After that, turn off the heat. Into the melted butter, mix in white sugar and brown sugar. Stir well until the sugar is melted and incorporated with the butter thoroughly. Add in the lightly beaten egg and vanilla extract. Stir well until everything is mixed together, and no lump is visible. Set it aside. In a bowl, mix all the dry ingredients together: flour, baking soda, and a pinch of salt. Shift in the dry ingredients to the wet mixture. Stir well until everything is incorporated. Add the chopped chocolate and fold until the chocolate chunks are mixed evenly to cookie dough. Spread the dough evenly in a heavy-bottom skillet. Place it in the preheated oven for 20 minutes until the top of cookie dough is golden brown. Take out of the oven, let it cool a little bit, and serve the cookie warm with chocolate syrup or vanilla ice cream. That recipe above is going to be your savior when you need to bake quickly for a dessert. 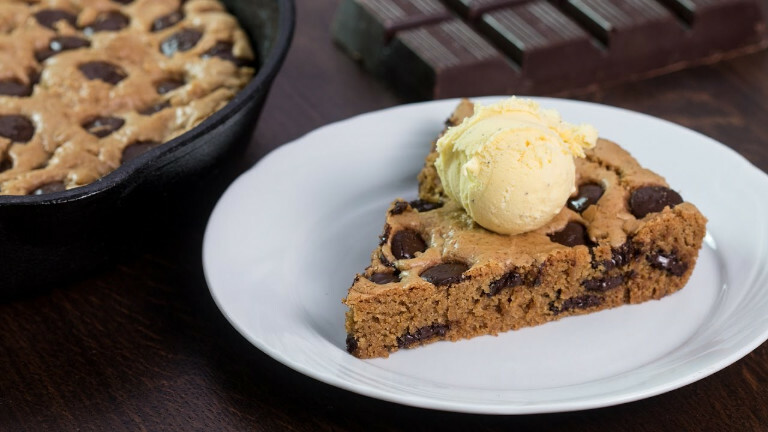 Do not give it a second thought because what you are going to need for a dainty dessert is surely the cast iron skillet chocolate chip cookie recipe above. Related Post "Easy and Delicious Cast Iron Skillet Chocolate Chip Cookie Recipe"